What's a Grenzzeichen you ask? 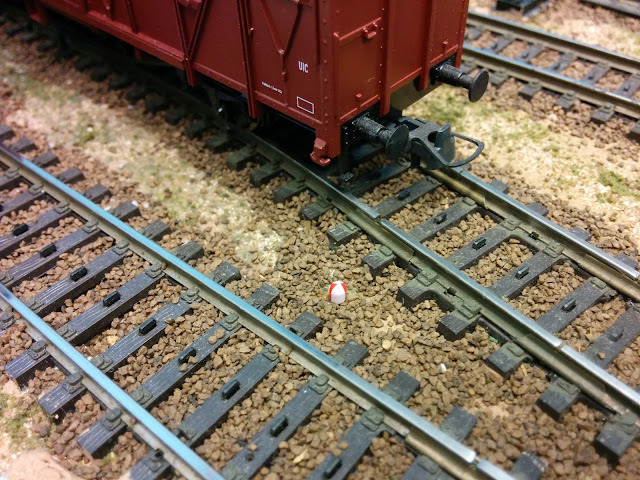 Grenzzeichen are used on in Germany wherever tracks diverge that are used to store cars or a train stops. The Grenzzeichen marks the location where a car on one track will foul the other track. 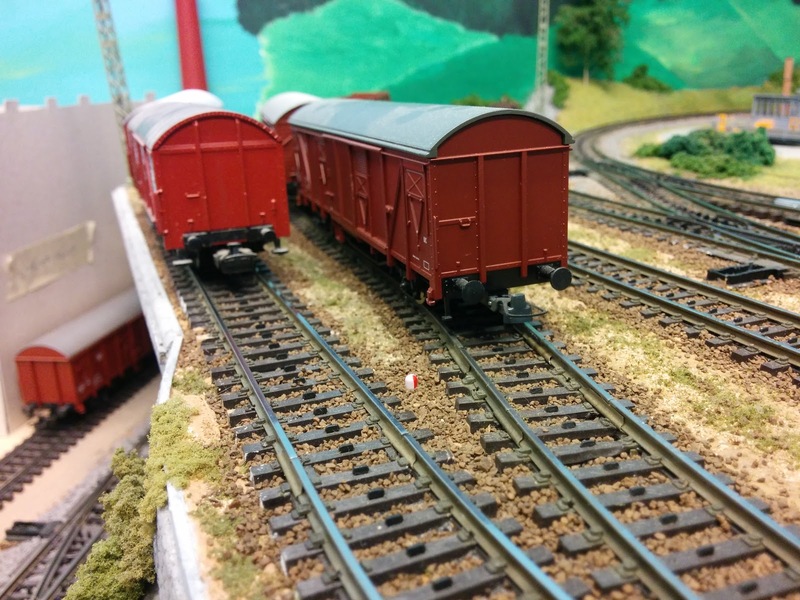 This is obviously useful for in switching yards, freight stations, and similar situations. The typical Grenzzeichen is a pipe stuck into the ballast with a round enamel head painted white and red in quarters. I have thought about how to model German Grenzzeichen for a while. I considered painting a round piece of styrene. However, in HO scale the head is only 2mm in diameter, and painting quarters of that in red accurately was a little bit more than I felt like doing. I considered early Reichsbahn Grenzzeichen, a white stick with a red top, but by the early 1970's they would have been replaced pretty much universally. The other issue is that a scale Grenzzeichen is really small, and easy to overlook when switching cars. If I put those things in, I also want to use them for their actual purpose. I was willing to make them a little bit oversize so that they are more obvious to operators. Eventually, I found Erbert Modelltechnik, a small supplier in Germany, that makes scale Grenzzeichen among other neat lineside details, and I ordered the O-scale version, which is just perfect for my use case. Ordering was easy and the various parts arrived with no fuss within a few days. Most of the roadbed in Emsingen and Talheim stations is not yet ballasted, so it's a bit early to fuzz around with this kind of detail. Nevertheless, I did try it out in the yard, and I very much like the effect.